As we all know, money plays a very important role in the world. So as your child develops an understanding of the world, it helps to instill a positive view toward money rather than a negative one. The following are a few tips to help you get started. Let’s step back for a moment and view money from an objective perspective. On one hand, money is simply an economic good used to facilitate the exchange of other goods. That’s all it is. You pay money to buy goods and receive money by selling goods or services. On the other hand, we also know that views toward money exceed money’s function. It has social, cultural, and even moral implications. We’ve all been raised with certain beliefs about money, some healthy and some not. Although money is a complex matter, when it comes to teaching your children about money, it’s best to keep it simple, straightforward, and positive. We’ve all heard the saying “money is the root of all evil.” Really? If a child were to believe such a thing, then the entire world – one in which people constantly need to buy and sell things – might seem wrong and contradictory. There are variants of this belief associating money with greed, abuse of power, and a host of other awful things. Exposing a child to such beliefs can be dangerous. Associating money with morals is both overly simplistic and harmful. There’s an excellent arts and crafts activity on the icanteachmychild.com that you can use to help teach your kid how to distinguish between the two. If you are up to the task of taking on a more teacher-like approach, Brainpop also has some good resources to check out. 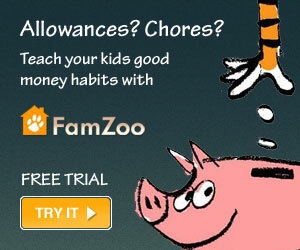 Eventually, your kid will need to learn that money doesn’t grow on trees. Money is earned. That’s why you go to work. The pride of having worked to earn money and the sense that larger tasks can yield higher pay are things that your child can learn. Set aside reasonable chores for a given price. As your child gets older, he might attempt to negotiate the monetary value of different kinds of chores, size of chores, or effort/pay ratio. This reveals a healthy ability to grasp and question concepts about money. Although many educators will argue that Monopoly board game (or Monopoly Junior ) is more of an entertainment-driven game rather than an educational one, it remains among my all-time favorites. In addition to providing kids with the opportunity to count money and change, Monopoly introduces kids to the concepts of risk, chance, and investment.